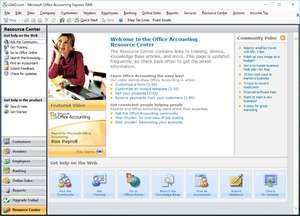 Microsoft Office Accounting (formerly Small Business Accounting) is a discontinued accounting software application from Microsoft targeted towards small businesses that had between 1 and 25 employees. The last version, Microsoft Office Accounting 2009, was available in both Express and Professional editions. It included several new features, including tax preparation add-ins, 20 new reports and a Spanish language pack. On 16 November 2009, Microsoft discontinued its distribution of the Microsoft Office Accounting product line in the US and UK. Version 2009 is a freeware program which does not have restrictions and it's free so it doesn't cost anything. For security reasons, you should also check out the Microsoft Office Accounting Express download at LO4D.com which includes virus and malware tests. Additional screenshots of this application download may be available, too. Microsoft Office Accounting Express has a presence on social networks. Microsoft Office Accounting Express download been highly rated by our users.